Fresh bananas, pudding and shortbread cookies come together in just a few minutes to form this delicious no-bake dessert guaranteed to please a crowd. 2 packages of Cheesman Cookies or Nilla Wafers 7.25 oz. Directions: Start by placing cookies from one package at the bottom of pan. Place the sliced bananas on top of the cookies. With a hand mixer, beat together the vanilla pudding mix and milk. In another bowl, beat together the softened cream cheese and sweetened condensed milk. Fold in whipped topping with cream cheese mixture and then fold that in with the vanilla pudding. Pour mixture all over the bananas and smooth out until even. Place the second box of cookies on the top. Chill for a few hours until ready to serve. Serves about 12. Tip: Before you start, open both packages of cookies and use any broken cookies on the bottom layer – save the pretty cookies for the top! I love how this tastes after it has been in the fridge because the shortbread cookies soften – it’s almost like refrigerator cake. We recently made this for my daughter’s birthday because she LOVES bananas. It was such a big hit! Enjoy! 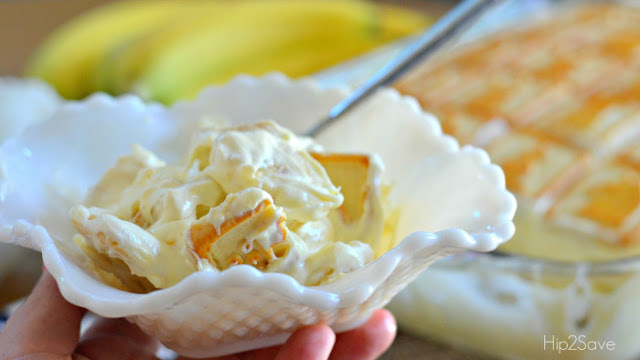 0 Response to "Best Ever Banana Pudding"